Race 4 of the season was the Glow Cosmetics seven kilometre handicap at Heybridge. The course took runners to the Howth weighbridge and return. 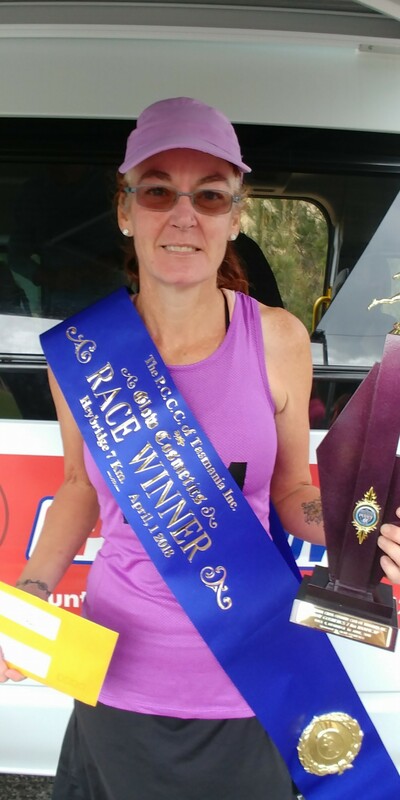 This looked suitable for the Frontmarkers who have dominated the season so far, and so it proved to be with Somerset runner, Sally Atkinson, taking out a well-deserved victory. Atkinson, a veteran of almost four hundred PCCCT runs, was most unlucky in the first race of the year when she as grabbed close to the line after an error led to a slightly longer distance being run than what was scheduled. This was her fourth win with the club, her last being seven years ago. She also had a close call on Sunday just holding off first starter Terry Watson, with fellow frontmarker and race favourite, Karina Mason, in third. Having trained for the Gone Nuts race, where she completed the full 101 kilometres, Atkinson was very fit. Stuart Greenhill led the field early on until Mason took over. Back markers Ben Brockman and Wayne Wiseman were looking good and further up the field Susan Moodie and Anna Murton looked chances. Anna Murton and Debbie Riley both performed well, while Ron Chequer turned in another promising run. However, Atkinson was not going to be caught this time and was delighted to break the tape. Fastest male and female were Brad Taylor and Lyn Saint-John respectively. Nominated time winners were Robyn Luttrell, Kasey Aichberger, Heath Bramich and Lachie Riley.